Biconformal gauging of the conformal group gives a scale-invariant volume form, permitting a single form of the action to be invariant in any dimension. We display several 2n-dimensional scale-invariant polynomial actions and a dual action. We solve the field equations for the most general action linear in the curvatures for a minimal torsion geometry. In any dimension n > 2, the solution is foliated by equivalent n-dimensional Ricci-flat Riemannian space-times, and the full 2n-dimensional space is symplectic. Two fields defined entirely on the Riemannian submanifolds completely determine the solution: a metric eμα, and a symmetric tensor kμν. Published by Elsevier in Nuclear Physics B. Author preprint is deposited in arXiv.org and is available for download through link above. 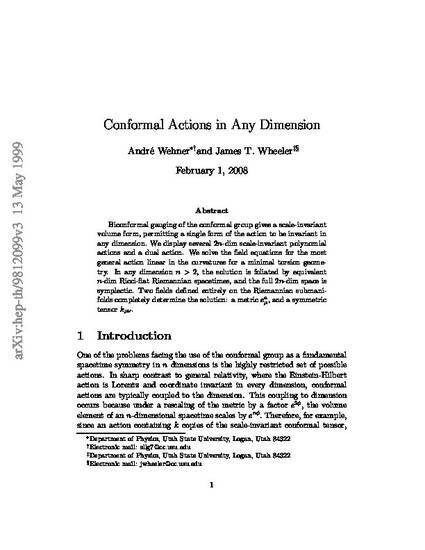 André Wehner, James T. Wheeler, Conformal actions in any dimension, Nuclear Physics B, Volume 557, Issues 1-2, 20 September 1999, Pages 380-406, ISSN 0550-3213, 10.1016/S0550-3213(99)00367-3.